The Peleliu operation closely resembled no other in the Pacific war in which Marines participated; yet in no respect was it wholly unique. In a sense it was a repeat performance of Tarawa and the Marshalls, with overtones of Saipan and Guam; and it presaged the pattern of things to come on under-tunnelled Iwo Jima and, perhaps more particularly, in the high ground of Okinawa. Although many of its aspects were dramatic and spectacular in themselves, the operation produced no important features which were entirely novel when the war is viewed in perspective. Several, however, are of interest to the student of warfare. Perhaps the most significant of these on the historical level was the unequivocal demonstration of the value of sea power1 in effecting economy of manpower. The forces defending the Palaus were notably superior in numbers to the land forces attacking; yet because the latter were able to concentrate their full striking power against the vital objective while the U.S. Navy denied the Japanese the sea lanes necessary to pour in substantial reinforcements, effective control of the entire island group was achieved by commitment of a fraction of the assault troops which would have been required had command of the sea been less absolute. That doubt should be cast on the strategic importance of this seizure2 is unfortunate to the memory of the men who fought and died there. And that is a matter on which no definite conclusion can be reached: because the conquest was a fait accompli prior to the invasion of the Philippines, no one can state with full certainty what would have happened had it not taken place. What is known is that Peleliu, together with air facilities subsequently developed on Angaur, proved exceedingly useful as a support and staging point for the Philippines throughout that lengthy campaign. Equally important, the Japanese were denied the whole Palaus chain as a base and staging area for attacks on U.S. naval shipping and lines of communication supporting the Philippines invasion. 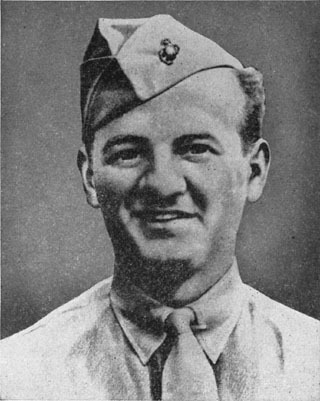 CORPORAL LEWIS K. BAUSELL won the Medal of Honor on D-Day for his heroism in smothering a greneade's explosion with his own body. Marine Corps through two decades of peacetime study and perfected in the crucible of combat on the long road from Guadalcanal to the fringes of the Japanese Empire. This was demonstrated by the quick and efficient securing of a beachhead against the heaviest kind of resistance by an assault force considerably smaller proportionately than prescribed by doctrine to insure success in a landing of this nature. That subsequently the operation proved long-drawn-out and costly is attributable to factors extraneous to the purely amphibious aspects: the nature of the terrain, and the determination and resourcefulness of the enemy. For Peleliu was also notable in demonstrating that the Japanese, too, had learned by experience. One thing they had learned was to minimize their losses from naval gunfire.3 And they had gained security consciousness. In marked contrast to recent goings-on in the Marianas, U.S. troops noted a dearth of captured operational maps, orders and miscellaneous documents packed with useful information, a dearth astonishing to intelligence officers whom long experience had taught to take such sources for granted. As had been noted in passing, there were no frantic, futile banzai charges to simplify the attackers' problem; for the first time in the Marines' experience in the Pacific, the Japanese made good their tactic of exacting a maximum toll of their enemies in fighting to the death. Though it could not be foreseen at the time, these seeming phenomena were to characterize enemy procedure from this time onward. Two new Japanese weapons made their appearance, which were also destined to be encountered again.4 One was a highly effective 150mm mortar, resembling a king-size 81mm, with a tube more than six feet long and a base plate so heavy as to render it primarily a static rather than a mobile weapon. The second was a homemade rocket, improvised by attaching a propellant charge to the base of a 200mm naval shell. This detonated with a terrific concussion--when it detonated at all. What little information was gleaned concerning this came from examination of the several duds which fell within the lines, for no launching device was ever found, nor was any prisoner taken who would admit knowing anything about it. Evidently it could not be aimed but was simply launched in the general direction of American-held territory. Lacking stabilizing fins, it usually made its descent as described by one eyewitness, "end over end, like a badly punted football." Ineffective as this was on Peleliu, it was to prove but the crude forerunner of the infinite variety of self-propelled missles which were destined to lend variety, if little feeling of security, to life on Iwo Jima a few months later. was the long-range flame-thrower. This performed yeoman service, yet the vulnerability of the LVT as a carrier for a purely offensive weapon proved a limiting factor throughout the operation. This came as no great surprise; the amtrack was simply the most practical vehicle to which this new device could be adapted in the short time available. With development of a mount suitable to the Sherman tank, the long-range flame-thrower went on to play its highly useful part in subsequent operations. NEW JAPANESE WEAPON. 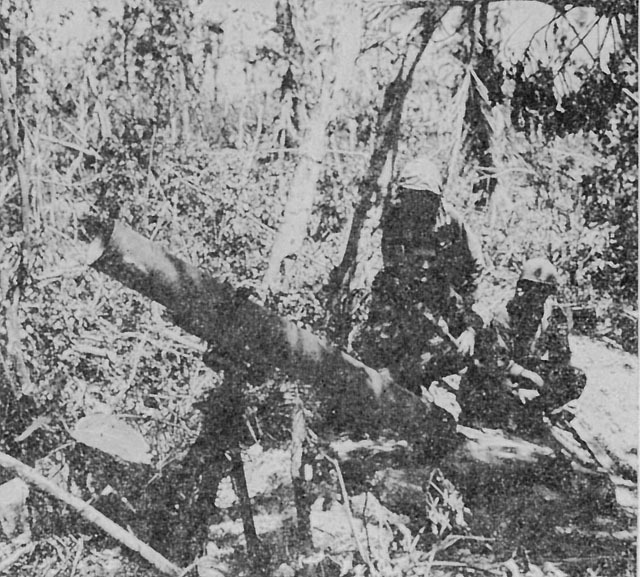 This king-size 150mm mortar made its first appearance at Peleliu. Projectile lies on base plate. On the credit side, however, the volume of fire actually delivered did achieve two highly useful results: it sheared away much of the covering vegetation, thereby revealing the true contours at last and reducing the enemy's concealment; and it partially neutralized the high ground during the initial landing to the extent that the shelling encountered by assault troops crossing the reef, bad as that was, proved less severe than what was to be encountered in some later phases. And once the Marines were ashore and able to pin-point profitable targets, fire missions delivered on call were nearly always accurate and effective. 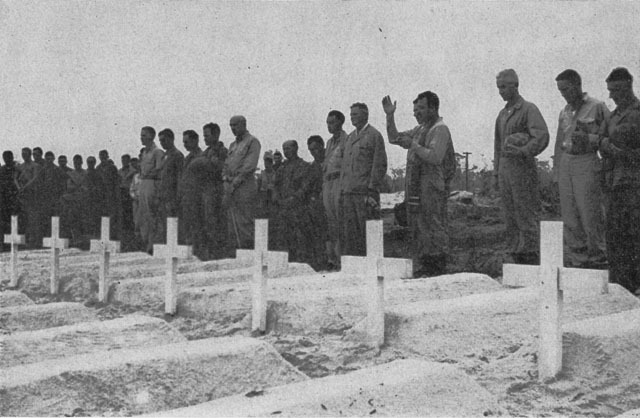 DEDICATING PELELIU CEMETERY. General Rupertus near center with cane; Colonel Puller on his right. Group on extreme right: General O. P. Smith, Colonel Harrison, Colonel Harris. of fire-swept razorback ridges and barren declivities devoid of natural cover. Here, if ever, was essentially an infantry battle, with all supporting arms and troops concerted to help the man on foot in their several ways and with varying degrees of effectiveness, again mainly as dictated by terrain conditions. During the initial phases, their parts were the conventional ones they had been trained to perform. But once the fighting entered the ridges, more particularly after resistance was localized within a constricted pocket, the battle became one of improvisation: traditional Yankee ingenuity and the will to live pitted against Japanese preparation and the fanatic will to die; with each offensive thrust, often each individual cave, presenting problems peculiar to itself. It is this feature, perhaps more than any other, which characterizes the Peleliu operation in the minds of those who participated or who have studied it. To the combat engineers, this meant greatly increased burdens and responsibilities; to the artillery, an early end to massed fires and the adaptation of individual weapons to direct fire missions. To the air arm, it meant a greatly curtailed field of usefulness and, because of the nature and location of enemy defenses, greatly reduced effectiveness despite the daring and ingenuity displayed. The tanks and LVT flame-throwers played their valuable parts to the bitter end, under difficulties never anticipated and rarely encountered elsewhere. But in the final analysis it was the man on foot with a weapon in his hand who took that evil ground and held it. operational, all the beaches necessary for the landing of supplies were in use, and base development was in full swing. Two months before the last wretched Japanese combatant was exterminated in the Peleliu ridges, capture of the Palaus in the strategic sense had become an accomplished fact, with upward of 25,000 enemy troops to the northward left to wither on the vine, as useless to the defense of the Empire as though they were stationed at the South Pole rather than within 500 miles of the Philippines. With capture of the high ground immediately dominating the airfield, the campaign degenerated into what was in effect guerrila warfare of a type peculiar to no people other than the Japanese. The defenders' potential for tactical action on any effective scale had been destroyed, and they were cut off from support and reinforcement. From that point onward, they killed solely for the sake of killing, without hope and without higher purpose. Victory over dug-in Japanese never did come cheap. 1. Including naval aviation. Because the enemy's air potential had already been destroyed, U.S. air power, as such, played a purely supporting role during the assault phase of the operation. 2. This doubt, together with the misapprehension regarding the nature and probable duration of the operation which was implanted in the minds of newspaper representatives, and by them transmitted to the U.S. public, resulted in the Peleliu operation being among the least known and least understood in the entire war. 4. Also found were several 200mm permanent mount naval guns with sawed-off barrels, the exact purpose of which was never determined as those captured were incompletely mounted and inoperative. 5. "The caves encountered on both islands presented a problem that so far has not been successfully solved by any supporting arm." IIIAC OpnRpt, Encl G, 4. 6. Fort. Oldendorf. Owing to the defeat of the Japanese fleet in the Philippines Sea and the delay in the Guam invasion, it was possible to subject that island to 13 days of pre-landing bombardment, with exceptionally good results. 7. "Peleliu indicated that tanks could survive a preparatory bombardment, and that NGF and air were at that time of little effectiveness in preventing hostile tanks from closing on the landing force." Stuart. 8. Figures certified and released by USMC Personnel Accounting System, 1Jun50. 9. 1st MarDiv SAR, II, Annex G, 2. These figures should be taken as approximate and indicative rather than accurate in detail. Owing to a change in the methods of casualty accounting, no up-to-date breakdown by units is available at this writing. 10. Figures from 81st Unit Hist, 1948.